The U.S. Navy christened its newest attack submarine, the future USS Vermont (SSN-792), during an 11 a.m. EDT ceremony Saturday, October 20, 2018, at General Dynamics Electric Boat in Groton, Connecticut. The principal speaker was Vermont Governor Phil Scott. Ms. Gloria Valdez, former Deputy Assistant Secretary of the U.S. Navy (Ships), served as the ship’s sponsor. 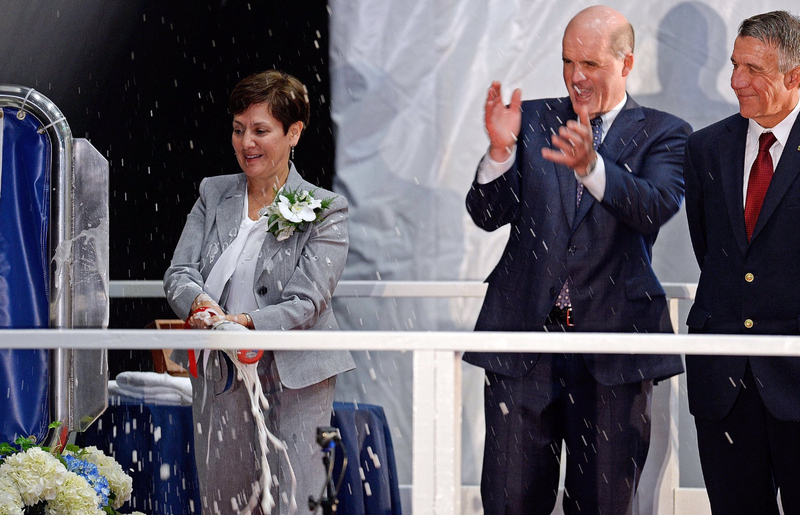 In a time-honored Navy tradition, she christened the ship by breaking a bottle of sparkling wine across the bow and state, «In the name of the United States, I christen thee». «The future USS Vermont (SSN-792) honors the contributions and support that the state of Vermont has given to our Navy and Marine Corps team throughout the years», said Secretary of the U.S. Navy Richard V. Spencer. «For decades to come, this boat and the Sailors who will serve on it will stand as a tribute to the patriotic people of Vermont and a testament to the value of the partnership between the Department of the U.S. Navy and our industry teammates». The future USS Vermont, designated SSN-792, is the third U.S. Navy ship to bear the name of the «Green Mountain State». The first Vermont was one of nine 74-gun warships authorized by Congress in 1816. The ship spent her early life laid up, but was put into service as a store and receiving ship during the Civil War. She continued in that service until struck from the Navy list in 1901. The second Vermont (Battleship No. 20) was laid down in May 1904 and commissioned March 4, 1907. She was a member of The Great White Fleet that conducted a world cruise during the Presidency of Theodore Roosevelt. Later she participated in the American occupation of Vera Cruz, Mexico. During World War I, she served as an engineering training ship before being converted to carry out her final missions as a troop transport, returning about 5,000 World War I U.S. service members from Europe. She was decommissioned June 30, 1920. The future USS Vermont (SSN-792) is the 19th Virginia-class attack submarine and the first of ten Virginia-class Block IV submarines. The ship’s construction began in May 2014 and it will deliver in the fall of 2019. USS Vermont (SSN-792) will provide the U.S. Navy with the capabilities required to maintain the nation’s undersea superiority well into the 21st century. Virginia-class submarines are built to operate in the world’s littoral and deep waters while conducting anti-submarine warfare; anti-surface ship warfare; strike warfare; special operation forces support; intelligence, surveillance, and reconnaissance; irregular warfare; and mine warfare missions. Their inherent stealth, endurance, mobility and firepower directly enable them to support five of the six maritime strategy core capabilities – sea control, power projection, forward presence, maritime security and deterrence.